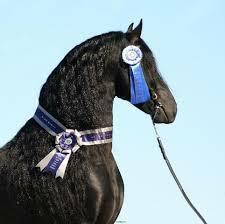 The Friesian is a horse with a compact build and superb bearing that stands approximately 15 hands at the withers. The coat is exclusively black, yet they sometimes have a small white mark on their head. The head is long and narrow with a straight profile, full forelock, short, pointed ears, and gentle, expressive eyes. The neck is quite short but well-arched; the withers broad and not very prominent, the back straight and short, the loins broad, the flanks rounded, the croup muscular and sloping, the tail full, the chest broad and deep, the shoulder long and sloping. The legs are muscular with broad joints and some feather below the cannons; the foot is large and strong. click here for the official FHANA conformation!